One crafting project is complete. The other was to be prepped yesterday but a 13-pound black impediment kept lying on the material which prevented cutting out the pattern. Plus, when I would sit down to get off my feet, she demanded my lap. We spent about an hour dozing in the recliner. It's lovely, but it means things I'd like to get done don't. Part of both projects is selecting buttons for the front. When I bought the material, I also bought buttons. I wasn't completely happy with the selection at JoAnn Fabrics. I had specific buttons in mind, but I could not find them. Better get something that will work than to skip that part and wind up with no buttons. As project one came to the button stage, I decided to get out my big jar of buttons and have a look. This is decades of button saving. Each one is a story unto itself. Only a few I actually remember. Many are single buttons with no mate. Many are buttons that have seen use on something else. When that something else got too worn to be useful, the buttons were removed. I remember reading this was a common practice among women in the 19th and early 20th century. Buttons were a luxury for the common folk. Clothing was held together with pins. 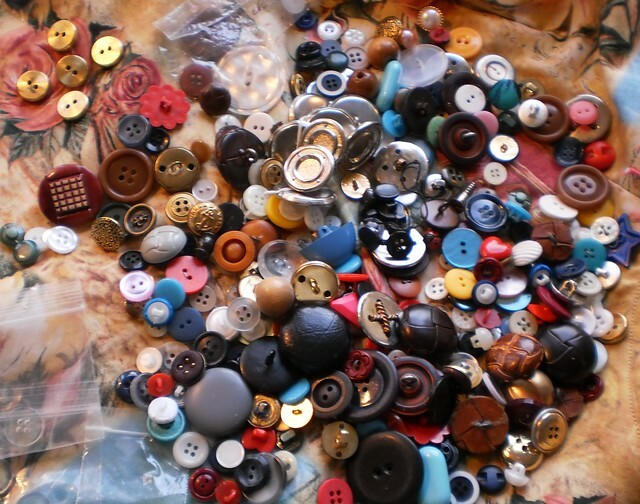 If you were fortunate to have the means to buy something that had buttons, when that item was tossed, the buttons were saved because they generally didn't wear out. I know the dead were not buried with their buttons. The clothing worn was sewn shut and the buttons used for something else. We might find that a bit morbid but it's quite the example of "waste not, want not". I also remember reading a complaint against button manufacturers and pattern designers. I need 4 buttons. I have to buy 6 to ensure they match. Even if I sew an extra button into a seam, I still have one left that I can't use. There was a hew and cry to make button cards in 4s and 5s. You can now find buttons on cards in amounts of 1, 2, 3, 4 and 5. There are cheap buttons of standard design on strips of 6. It just depends upon your taste and what you are looking for. I remember, with great fondness, the stores that had not only buttons on cards, but buttons in small bins. Those were the expensive buttons, sometimes $2 to $3 per button. But they had character and design. If you were making a coat, for instance, that only needed a couple of buttons, you might splurge and buy ornate buttons. I can't remember the last time I was in a store with buttons loose like that. Unfortunately, in this day and age, shoplifting of loose buttons would be rampant.